I don’t take sides, I favour nobody. Maximilian Voloshin was a great poet. He was an artist, a visionary, a man insight who stood as one in his allegiance with Truth. Voloshin is today unknown in the West, untranslated. He is forgotten in a time when neither the artist or the poet are held in esteem, when truth is misunderstood. Maximilian Voloshin’s clear understanding of the human condition enabled him to see past the thick illusion of events of his own Russian nation – the revolution and civil war that lead to the creation of the Soviet Union. Maximilian Voloshin did not take sides. He stood as one with the Truth. 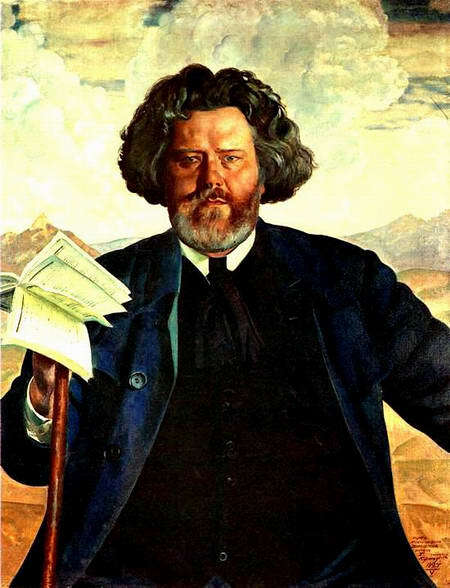 Born in Kiev in 1877, on Whit Monday when the Earth is said “to celebrate Her birthday,” Voloshin spent much of his youth in Crimea, a land of many cultures, fabled as far back as even the ancient Greeks in the songs of Homer. From childhood he was noted for his remarkable memory and eagerness to perceive reality – “to see, understand, know and experience everything.” He started writing verses as early as secondary school and became extremely demanding of himself. Voloshin’s distinctive way of thinking allowed him to realize at an early age that the existing educational system was not a source of true knowledge. “None of the ideas or bits of knowledge have ever been picked up from either a secondary school or university,” he observed. Is not difficult to realize. Everyone may be born twice. Isn’t it me. Wisely interned there by destiny? His acquaintance with the Orient helped him to see the scantiness of European knowledge, true and imaginary values of European civilization. Later Voloshin mentioned that during his studies in the West he was “only a sponge absorbing everything through eyes and ears.” Travelling around Europe for many years Voloshin mastered the art of the paintbrush and pencil, as well as the art of the word. Maximilian Voloshin got to know the entire European culture in its origin and then he screened off all that was “European” so that only the “human” remained. After that, he turned to other civilizations – India and China – to learn and “seek after the Truth.” An opportunity to come closer to the Orient in its origins – Buddhism – was the first religious step for Voloshin. In the “wanderings of his spirit,” he was trying to find the single religion that would embody the highest and all-permeating spirituality, a culture with internal integrity, harmony and balance in all parts, excluding contradictions between individual and society, belief and knowledge, mind and emotions. Voloshin was familiar with an Oriental system of the universe and believed in the existence of many gods, although he admitted that he could not think of his spirit outside Christ. And keep it in oneself forever. All are in me, and I’m in everyone. For them protection, and advise them too. To prevent the brothers from ruining themselves and killing each other. Voloshin’s spiritual stance enabled the poet “in most troubled times” to find such words and perspective that were “acceptable to both parts.” His tolerance and ability to resist the temptation of hatred, contempt, “sacred anger,” and “keep tirelessly loving both enemies and monsters of cruelty and even allies” was strengthened by a belief that love will in the future be a sole basis for human society. In 1917 Voloshin returned to Russia. This was just at the time of the bloodletting of the revolution. “When a mother is sick, the children don’t leave her,” he said. Compassionate, fearless and dynamic, Voloshin rushed to protect the innocent. Without taking sides, Voloshin opposed only the terror. He hid refugees from both sides within his house. Faced with the question of how to stand against armed terrorists, Voloshin’s answer came in revelation. From within, he realized that “all the positive creative forces of man are only in Love.” Now armed with that power of Love, he saw the events around him in a new light. Compassion replaced anger. The executioner, he realized, needs salvation more than the victim. He believed in the good inherent in every person – even the most hopeless. Voloshin noted that perhaps people’s prayers are not heard because they always pray for the victim, while it is the executioner who actually needs salvation. So, while dealing with a terrorist, he put his attention on him and prayed intensively to the Divine to save him from killing the people. His faith and dedication were so strong that, to everyone’s surprise, he always succeeded. People could not understand how he could make these miracles happen. Typical of Voloshin’s unselfish service, he once saved the life of a neighbour. The czarist White Army had arrested a man named Marx and threatened to kill him only because he had been a distinguished civil servant when the Red Army had controlled the village. The man’s work had in no way been connected to politics. The soldiers simply felt that he was guilty of serving the Red Army – guilty by association. As Maximilian Voloshin was a neighbour, Marx’s wife and daughter came to enlist his assistance. Voloshin, along with the family, immediately joined the train that was transporting the prisoners. Voloshin protected Marx throughout the journey by simply telling the soldiers not to kill him. Upon arrival, the prisoners were separated and Voloshin found himself alone on the street. As it grew dark, he did not know where to go. Voloshin wanted to find the person who held the fate of Marx’s life, but he did not know which way to turn. Marx was surely in danger of being executed at any moment. In despair, Voloshin prayed to the Divine Power that he might meet the right person. Within moments soldiers arrived on the scene and arrested Voloshin for violating the local curfew. They took Voloshin to the main quarters of the White Army. There, officers quickly recognized Voloshin, as he was a famous and respected poet. One of the officers even invited Voloshin to his house for dinner. As the Divine would design it, Voloshin’s host for dinner was the very man who held sway over Marx’s life. Voloshin, in his simple approach, asked the officer to spare his neighbour. The soldier became angered. “All the people like him must be killed.” Voloshin realized that further mental argument would only act to entrench this position. Instead, he simply let the officer continue. He allowed him to speak out in his anger. While he was speaking, Voloshin put his loving attention on him. He prayed to God. In a short time his dinner host became more relaxed. He became calm. His words took a different course. “But if you want to save this man,” he said and he went on to explain what actions Voloshin should follow to save Marx’s life. He told Voloshin to request a civil court hearing. At this hearing Voloshin testified on Marx’s behalf. He told the judge that Marx’s actions were free of any politics. He said that Marx was not supporting the Red Army in his job, but rather supporting local peace and order. Voloshin’s intervention extended to all people. Once when some fishermen were barred by the military from fishing their usual waters, Voloshin was asked to lend assistance. Flying a white flag of peace from a fishing boat, Voloshin approached the armed naval ships. Once on board, the sailors recognized Voloshin. Such was the high regard for the poet that, after the reading of a few poems, the sailors granted the fishermen free access to their fishstock. Maximilian Voloshin’s miracle was that he did not take sides. He simply spoke the Truth. After the Russian civil war and the establishment of the Soviet state, Voloshin opened the doors of his home to the poets, writers, artists, scientists and free thinkers of his nation. Trying to translate his convictions and principles into life, Voloshin made his house in Koktebel an ashram for free-thinkers. In this sanctuary, he could faultlessly foresee the talent of a young poet, encourage him and teach him an internal vision. Following a divine principle of learning, he demanded as much from others as from himself in creative work. People came so that they might find refuge from the insane atmosphere of the cities and so that they could feel like human beings, not slaves or machines. There they discussed the real events of Russia without fear of arrest. Almost all the major poets and writers of the nation, Voloshin’s contemporaries, came to enjoy his generous hospices. In his creative work, Voloshin’s main principle was to fully dissolve his own ego in art. During his studies in Europe he was attracted by an anonymous and nationwide feature of medieval architecture. Voloshin believed that individualistic art of modern times would give way to a collective art in the future. And heaven’s peace in silence of the Earth. Throughout the remaining years of his life, Maximilian Voloshin wrote about the destiny of his Mother Russia and the world. He believed that Russia would gain strength in overcoming her obstacles. He knew that Russia would become a great spiritual country. Voloshin was a critic of materialism and fundamentalism. He wrote about the transformation of the human being that would occur when “love will melt the world.” He knew that this inner transformation was a necessity. In his very last years, Voloshin wrote poems depicting the lives of Russian saints who worshipped Mary, the mother of Christ. He saw Her hand in helping them overcome the persecution of the state and of the Russian Orthodox Church. In these poems he recognized Mary as the saviour at the time of the Last Judgement. And logically discuss the findings. Day and night the printed pages. The very ancient, hidden fire..